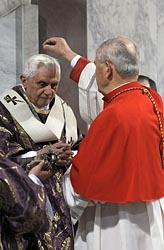 Pope Benedict XVI begins Lent with an ancient Roman Ash Wednesday tradition. The Holy Father will preside over a penitential procession from the Basilica of St. Anselm to the the Basilica of St. Sabina, where he will celebrate Holy Mass and the blessing and imposition of Ashes. Join Salt + Light's Pedro Guevara Mann and Alicia Ambrosio for full live coverage, February 17th, at 10:30am ET/7:30am PT, or catch the encore presentation at 8pm ET/9:30pm PT.